Santa Paula, CA – Abrisa Technologies now offers an expanded range of standard stock non-glare (NG), anti-reflection (AR), and anti-reflection coated non-glare (NG/AR) glass solutions that are ready to be custom fabricated and screen printed to your exacting specifications. Ready-to-fabricate non-glare sheet sizes are available up to 78” x 46” and in thicknesses of 1.1, 1.9 and 3.0mm for non-glare soda lime in gloss levels of 60, 90 and 120. The non-glare glass can be provided 1 or 2 sides and is available in low iron, low sparkle. Additional options include AR coating of 1 or 2 sides and damage resistant HIE™ strengthened aluminosilicate glass in lieu of soda lime for increased durability. Ready-to-fabricate AR coated sheet sizes are available up to 126” x 88” and in thicknesses of 0.7 to 3.0mm. 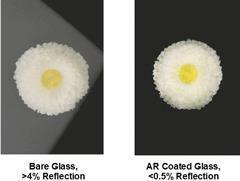 The AR coating can be 1 or 2 sided with options available for oleo/hydrophobic performance. The AR coatings can be applied to SCHOTT Borofloat®, non-alkaline Corning®Eagle XG®, SCHOTT D263® thin glass, AGC EN-A1 thin glass, HIE™ chemically strengthened SCHOTT AS 87, Corning® Gorilla® Glass, and AGC Dragontrail™. Abrisa Technologies is a recognized global supplier of high quality, fabricated glass components, optical thin film coatings, and custom glass solutions for a wide variety of industries. From our US based Abrisa Industrial Glass fabrication facility in Santa Paula, CA and our ZC&R Coatings for Optics division in Torrance, CA we serve diverse industries such as microelectronics and displays, semiconductor, military, automotive, aerospace, medical, biomedical and scientific R&D. We provide custom specialty flat glass and coating products for applications such as: flat panel display, touch and gesture recognition; visible to IR imaging and surveillance; entertainment, indoor and outdoor lighting; advanced instrumentation; and photonics.